Harte was young and a newly anointed Shield, having recently received his spurs. The third son of a Baron, he was sent off as a Page to another nobleman and then became a squire, serving Ser Brickell. He spent nearly seven years training and learning from the veteran Shield. Ser Brickell was not a young man, and his years of experience provided the Shield with a wealth of tales and knowledge, that he willingly shared with his ward. Harte cherished the tales and learned as much about chivalry and strategy from them as he did from the official training he was given. The fact that Ser Brickell was a Vassal to the young First Duke of Cainwen, Lord Cadwal, meant that Harte also frequented Castle Westhedge and the royal court. It surprised many when Harte, after being dubbed a Shield, proffered his services to the King’s Guard. He would easily have been welcomed, as a vassal, by any number of Dukes or Earls, and could have enjoyed a rich future. However, in his many visits to the court he had come to know many of the Guardsmen and the Shields that made up the King’s personal guard. They were richer in something more than just material treasures and Harte felt a sense of purpose in their duty. “Lieutenant Harte.” The Captain snapped. “Yes Captain.” Until two days ago, Harte had never met the Captain in command of the guardsmen protecting the Crown Prince and his sons. But it had quickly become apparent the man was not pleasant and Harte could only surmise he had done something to irritate the Captain, otherwise he could not explain why the man snarled every time he talked with Harte; which was as seldom as necessary for Harte to do his duty. Harte really couldn’t blame the Captain, though it wasn’t anything Harte had done himself. Court retainers and many of the King’s military were astounded by Harte’s rapid promotion to Lieutenant and assignment to Crown Prince Beynon’s personal guard. Gossips alleged that the Crown Prince’s closest friend, Duke Cadwal, had a hand in the placement. The First Duke told Harte that he would have welcomed Harte as a Vassal, but if Harte was set on the King’s Guard, then the First Duke would highly recommend Harte to the Crown Prince himself. Seen from that perspective, Harte assumed the rumors had truth at their roots, but he also knew the First Duke would never do anything for personal gain, and if he had anything to do with Harte’s assignment, the First Duke would have thought it would be to the Crown Prince’s benefit. Even with this knowledge, Harte still questioned the placement as he stood behind the Crown Prince, heir to the throne of Cainwen, and watched the man sitting by the fire. The Prince smiled and laughed with his oldest son, Mael, who had recently turned nine and stayed close to his father. The younger boy, by two years, Hafgan, sat to side with Grioral Malbery, son of the Earl of Greenmerrow. Harte had just met the Earl’s son and while he tried not to judge anyone until they proved themselves else wise, he had already developed a dislike for the man. He approved of the Earl’s loyalty to the young Prince, taking the boy under his wing and mentoring him after the accidental death of the Crown Prince’s wife, but being in the Earl’s presence gave Harte the same feeling when he came across a rattlesnake. It was just after nightfall, and Harte had become slightly distracted as he stood, alone, a few paces behind Crown Prince Beynon. Harte fiddled with the new engraved spurs, still finding it difficult to realize he was now one of the family of Shields, even though he had spend much of his life working toward this time. He remembered his shock the first time someone addressed him as Ser Harte, in the high bailey at Castle Mount Somerled. His thoughts were on these memories when a Guardsman called out on the far side of the camp. “Hold.” Two Guardsmen moved toward the tree line where a strange warrior rode out of the darkness into the light of the fire. He walked his horse right in between the two guardsmen, who seemed bewildered that anyone had even got this close to the camp. By the time they thought to draw their swords, the warrior had already reached the campfire and sat his horse staring across the fire at the Crown Prince. The Crown Prince pulled his oldest son by the arm and forced the boy behind him. Harte stepped up next to the boy, putting a hand on the Prince’s shoulder, while he drew his greatsword prepared to jump in front of the Crown Prince if needed. Malbery grabbed the younger son, and pulled him away so that they both stood behind three nervous looking guardsmen. The warrior just stared steely at the Captain as if he had not heard him. The guardsmen edged a little closer, their spears anxiously twitching. Harte looked over the Crown Prince’s head, who was still seated, and could see the top of the warrior’s leather breastplate, above his cloak, embedded with metal studs, and leggings of the same material. The Captain moved slowly, his movements restless; and Harte couldn’t blame him as Harte imaged the Captain also recognized the warrior’s leathers as armor traditionally worn by the Riddare of the northern kingdom, Haldane. Warriors that have proven themselves as skilled in their trade at sea as well as on the land. If not quite the same, Harte knew it to be equivalent of a Shield in the Cainwen hierarchy. The warrior lifted his head and stared beyond the Captain at Crown Prince Beynon, the warrior’s eyes narrowing and his head tilted slightly as if inspecting the Crown Prince. The Captain was preparing to follow through on this threat when, Harte noticed something and stepped around the Crown Prince, walking toward the campfire. “Hold your weapons,” Harte shouted and held up both arms so he could be clearly seen in the flickering light of the fire. “Harte,” The Captain screamed, the degree of his discomfort evident by the fact he had not called Harte Lieutenant or at least by his Shield title, Ser. “I think patience may be a better course your Majesty.” Harte turned his back on the warrior, ignoring the Captains command, and looked at the Crown Prince. The look the Captain gave Harte spoke of a retribution to come when they returned to the castle, but Harte realized something the Captain had not. Crown Prince Beynon looked at the Captain and then at Harte before he nodded for Harte to continue. 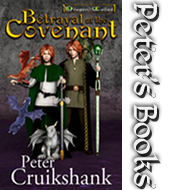 Harte turned back to the warrior and pointed out the warrior’s cloak to the Crown Prince. “In service, to the First Duke, I have traveled to Haldane several times.” He reminded Beynon of knowledge most of the others might not have. “Like the major Families of Cainwen each major Haldane Clan is represented by a different color. The only exception are members of the royal Haldane Family who wear multicolored cloaks.” Harte pointed, but did not touch, the warriors cloak which was woven of crossed blue, green, and yellow colors. 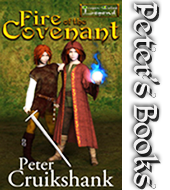 Once brought to his attention the Crown Prince leaned forward to look at the cloak in the dim light of the fire. The Captain was visibly tense, Harte understanding that his patience must have worn thin as his duty was to protect the royal family, and this unsettled situation made him nervous. The Captain began to step forward when the Crown Prince held up his hand freezing the Captain. He turned back to Harte. “Are you saying Harte that this…warrior is of the Haldane royal family?” Harte could see the Crown Prince’s mind working. This could easily become a problem if handled incorrectly. The Crown Prince frowned, and Harte continued to explain quickly before the Crown Prince became irritated. “There is one other exception.” The Crown Prince’s eyes said he was interested, but he continued to frown; which told Harte he had to make his point quickly. Harte walked towards the back of the horse where the Riddare’s shield hung. The warrior followed him with his eyes. Harte started to reach for the shield, but stopped short and looked up at the Riddare and nodded to the shield. The warrior’s lips tightened and he just stared at Harte with the same steely eyes. Harte stood there, his hands held up to, but away from the shield, and after a couple of moments of total silence he mouthed to the Riddare ‘Please’. The warrior waited a moment more and then nodded his approval. Harte lifted the shield off the horse. “How do we know this… “ The Captain glanced at the Protector. “Riddare has not come of the shield rightfully.” The Captain argued, but his stature dwindled. The Protector stared at Harte. His eyes narrowed, but after a moment nodded and pushed up the sleeve of his fur cloak. A raw wound ran between the Protectors wrist and elbow. It was a representation of the same dragon in flight, as on the shield, that had been burned into the Protector’s skin. The act had to have been done recently as the lines were still scabbing over. The Protector, his expression never changing, nodded. The Protector looked down at Harte, and Harte could swear he saw the hint of a smile. The Haldane then looked back up at the Crown Prince and nodded his head affirmative again. The Protector, still stone faced from the moment he arrived in camp, shook his head no. “Then my father, King Einion?” The Crown Prince questioned. The Crown Prince looked around at one son then the other, and the Protector must have anticipated the Crown Prince’s question, because he indicated no once again. The Protector reached for the front of his cloak causing the guardsmen; their spears having relaxed during the conversation, to now point steadily at the mounted Haldane. The Captain looked back up to the Crown Prince who waved his hand in response. Everyone, including Harte, just stared at the two children. Their youthful eyes were an emerald green. They were lit and shimmered; which Harte contributed to the reflection from the campfire. The first thought that went through his head was red hair, green eyes. Evil. Shades. Then he shook off the old superstition and looked objectively at the children, a skill that had served him well over the years. They were dressed in simple royal blue linen tunics with gold striping. Harte thought to himself Brynmor colors. Then he realized they were twins. Some of the guardsmen stepped back when the children were exposed. More than one put their three middle fingers together and touched them to their head, then lips, and finally, the heart, while they whispered a protective invocation. The entire camp became one of chaos; guards backed away and started talking over each other. Within the uproar, the Crown Prince stood. “Seize him and the vile children.” The Captain stepped forward, but not ahead of his guardsmen. “Alina be dead.” The Protector roared over the clamor and kept his eyes fixed on the Crown Prince. “Hold,” The Crown Prince shouted as he stepped around the campfire, pushing guardsmen out of his way as he came to stand in front of Harte and stared up at the Protector. “When?” The Crown Prince’s voice had softened, and Harte could see a sadness in his eyes. “Four moons past.” The Protector answered; his own tone grieved. “And these?” The Crown Prince looked from one child to the other, his face examining. “Alina’s.” The Protector picked up one child and lowered the child to Harte. The Crown Prince reached out and took the child before Harte could even put the child on the ground. The Protector handed the second child to Harte, as Harte watched the Crown Prince stare into the face of the first child. “If what Lieutenant Harte says, you have given the rest of your life to protect them.” The Crown Prince looked at Harte and then at the Protector as if looking for confirmation. Harte was amazed that the Crown Prince remembered his name as he had only been a member of the guard for two fast-paced days. He stuttered, but was saved embarrassment as the Protector answered first. “And mine.” The Crown Prince whispered with a weak smile, the look on his face a mix of pride dampened with sorrow. “Captain.” The Crown Prince called. “Yes, Sire.” The Captain ran up so fast that Harte had to keep from smiling. “Did you not hear me Captain.” The Crown Prince’s tone left no doubt as to his position. “Do you dictate to your Crown Prince.” The Crown Prince’s voice held a veiled threat. “No Sire.” The Captain of the Guardsmen put a fist to chest and bowed, his voice rose nervously. “Sire.” The Captain waited a moment, and when no other orders were given, he turned and started to make arrangements for an early departure. Harte had been so busy enjoying the Crown Prince’s roasting of the difficult Captain, that it had not sunk in until now, that he had been promoted again, in less than two weeks. And also would be taking up residence along with the royal family. Protector Dougal handed over the second child to the Crown Prince who bounced them both, one in each arm. One of the children wiggled and tried to get down, while the other one rested calmly in the Crown Prince’s arm.